September 7, Hebei CCP Provincial Committee Propaganda Department presented its “Yanzhao Raw Model & New Era New People”title to HBIS Serbian executive management team in the provincial broadcaster’s “Yanzhao Raw Model & New Era New People Show”telling the patriotic passion and hard working stories of HBIS teams. Member of Hebei CCP Standing Committee, Director of Propaganda Department Jiao Yanlong warmly met HBIS Serbian team and presented the Certificates and Medals of the Awards. HBIS CCP & Group Chairman Yu Yong attended the event. June 19th, 2016,during Chairman Xi Jinping’s state visit to Serbia Republic, Chairman Xi inspected HBIS Serbia and instructed to “Keep The Promises and accomplish a showpiece project in China & Serbia Cooperation and Belt & Road Initiative”. In the past two years, HBIS keeps the instruction in mind and fulfill its missions. It sends experienced, talented and hard working Chinese executives to HBIS Serbia, who work in a foreign country and honor their oath. After six months of the takeover, HBIS Serbia ended its seven-year-long loss and became the second largest exporter of the country. Last year, HBIS Serbia’s performance made its best historic record. HBIS Serbia is becoming a showpiece project in Belt & Road Initiative. Before the show, Mr.Jiao Yanlong warmly met the representatives of HBIS Serbia management team. 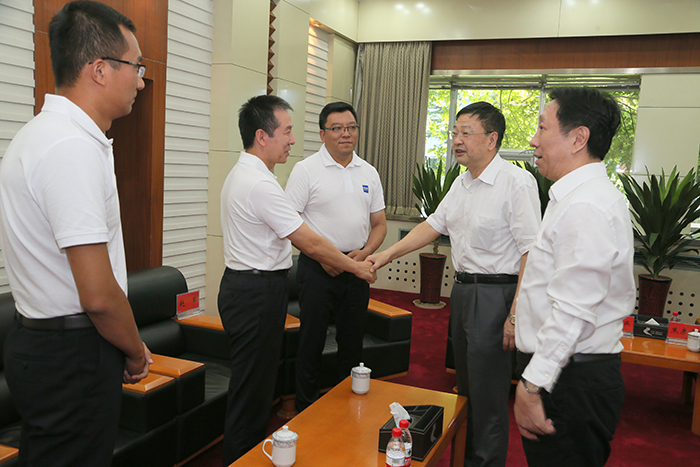 He shook hands with the representatives and highly valued the excellent performances the teams had made. In the broadcasting hall, the Yanzhao Raw Model & New Era New People show recorded the working stories of HBIS Serbia teams. The moments, the passionate stories of told by HBIS teams, Serbian employees and journalists presented the patriotic, hard working and dedicated teams from different perspective. In the hall, the anchor presented the <<CCP Hebei Provincial Committee Propaganda Department: Honoring The HBIS Serbia Executive Management Team “Yanzhao Raw Model & New Era New People”Title>>. In the document, The Department praises the HBIS Serbia Team as the advance the model of “The new era consciously carries forward the practice of patriotic struggle spirit, do not forget to remember the mission”. It makes the Belt & Road Initiative a new international consensus and becomes a pioneering model in international production cooperation and a golden business card of China. It is a ardent practitioner carrying the Xin Jinping New Era Socialist Thought with Chinese Characteristics and pursing a high quality development. In hot applause, Jiao Yanlong awarded the teams with Certificates and Medals. This show will be aired in Hebei Broadcast & TV Station Economy Channel on September 17.